Welcome to the First Olympic Games of ReVive! …and we certainly hope it won’t be the last! 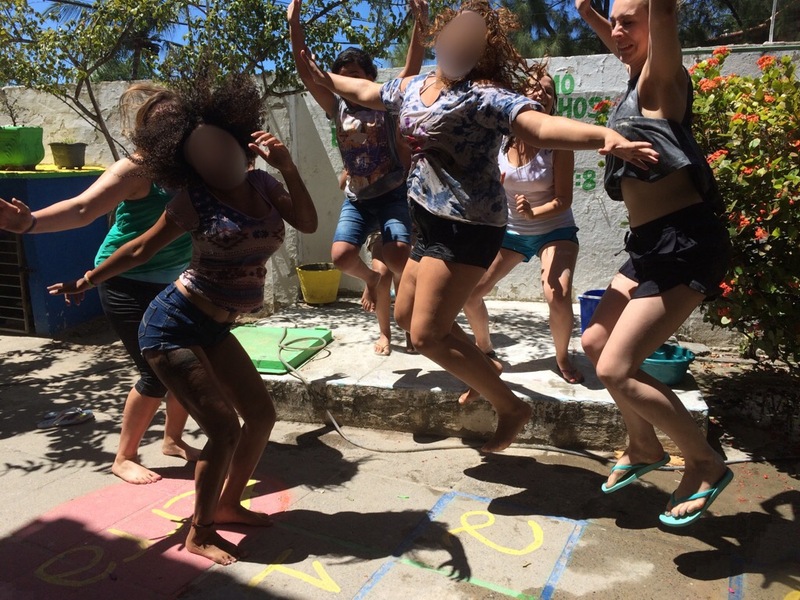 This Monday saw us begin our ReaViva Olympics with the girls. It has been a fun week so far, filled with activity and sunshine. 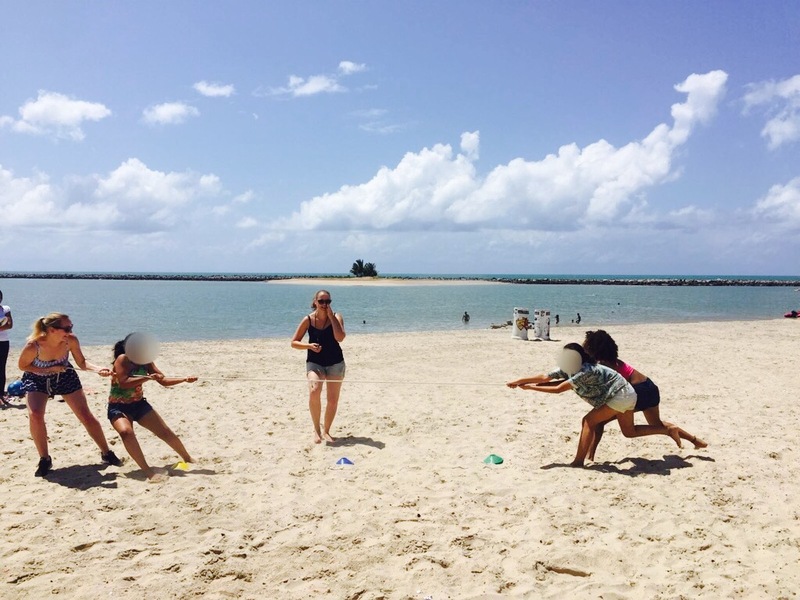 Monday morning and Tuesday afternoon saw us take some of the girls to the beach to begin scoring for our Olympic Games! The girls really enjoyed being out of the house, even if some of the physical activity was a bit much! Andy has stressed that he would like to encourage the girls to do more sports and exercise – we hope that this gave them a taster that it can be fun! We started with some high jump and long jump into the sand, moved on to a tug of war (the rope broke they were that strong! ), did some relay races, played volleyball, throwing and even got out the colourful parachute which the girls enjoyed playing games on. Some of the girls needed a bit of encouragement to play but we found that they watched each other and decided to get involved. It has been nice to see some of them growing in confidence in this area and learning from each other. The heat meant that we needed to take frequent water breaks and have breaks to cool our feet off in the ocean to soothe us from the burning sand! Doing the games has especially shown us each of the girls characters – I am pretty sure that there could be some athletes in the house if they keep at it! On Monday afternoon we began painting on the outside of the house – the green garage doors needed a repaint and we also started on repainting the outside of the house yellow! It is hot and sweaty work but we happily got on with some tunes to sing along to. Rosy even braved the heights to stand on the ledge of the upper floor, much to my horror but she did a great job. We were also helped out by Gordo who also enjoys a sing-along whilst scaling the walls! There is still lots of painting to do so we will be continuing this throughout the week. 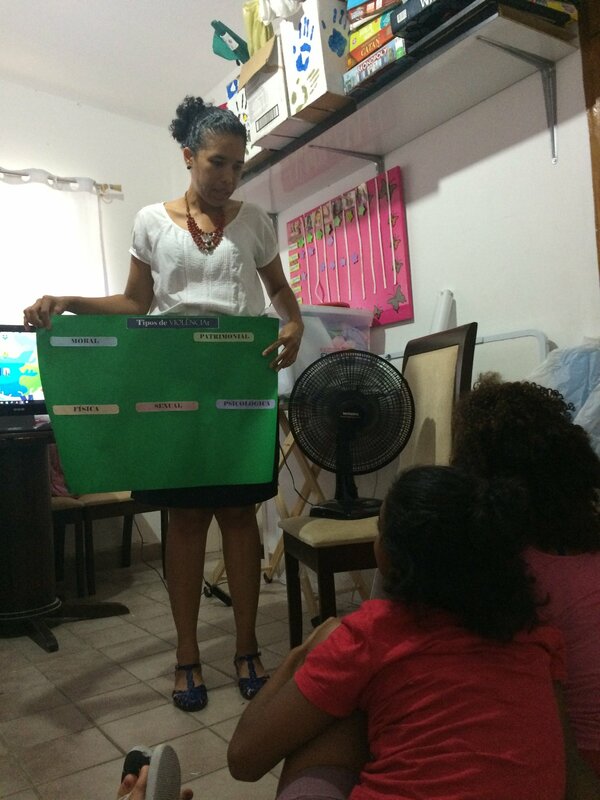 Monday evening saw us lead a devotional with the girls – this time looking at the biblical story of Ruth and Boaz. We asked the girls to get involved with acting this out – much hilarity was had by all but we think they connected with the point of it and the different ways Boaz reflects God’s love and protection. Yesterday evening we took a little trip up to old Olinda town – cobbled streets and terracotta roofs. 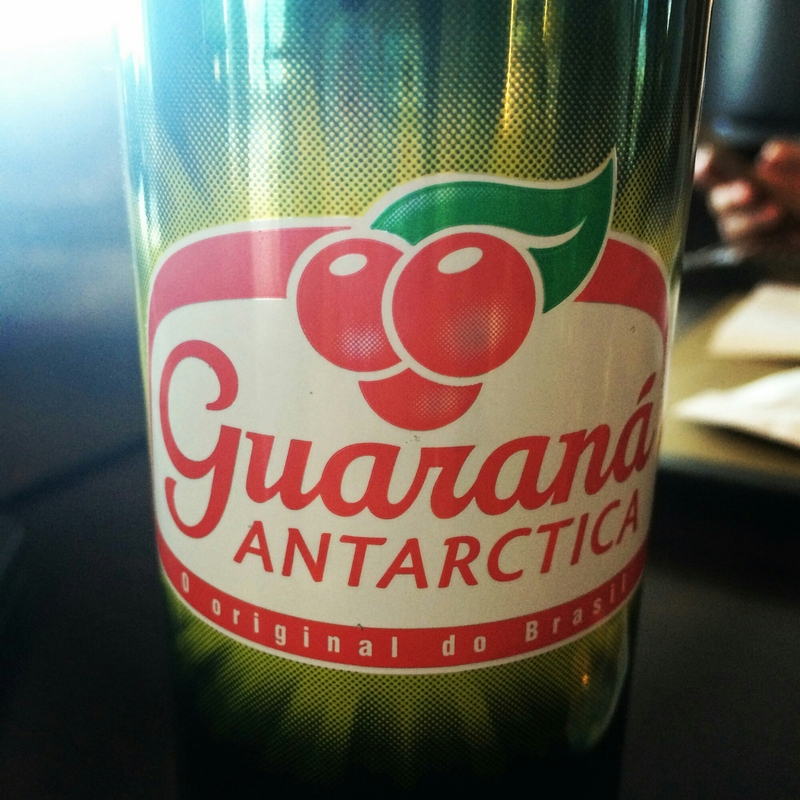 We treated ourselves each to a sweet and a savoury tapioca wrap, and of course a Guarana! 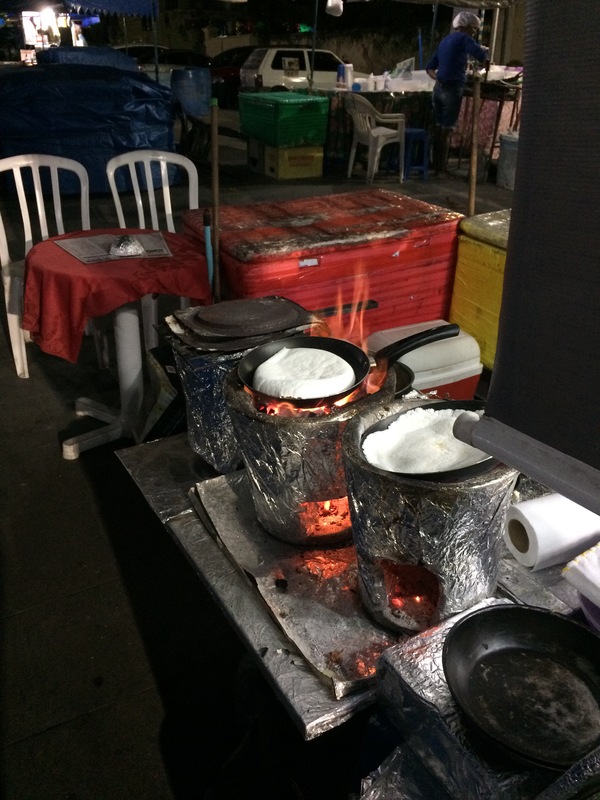 It was delicious street food – ate in the company of Gilda who was very efficiently running the street food stall. She could only be described as the Peggy Mitchell of the tapioca world. 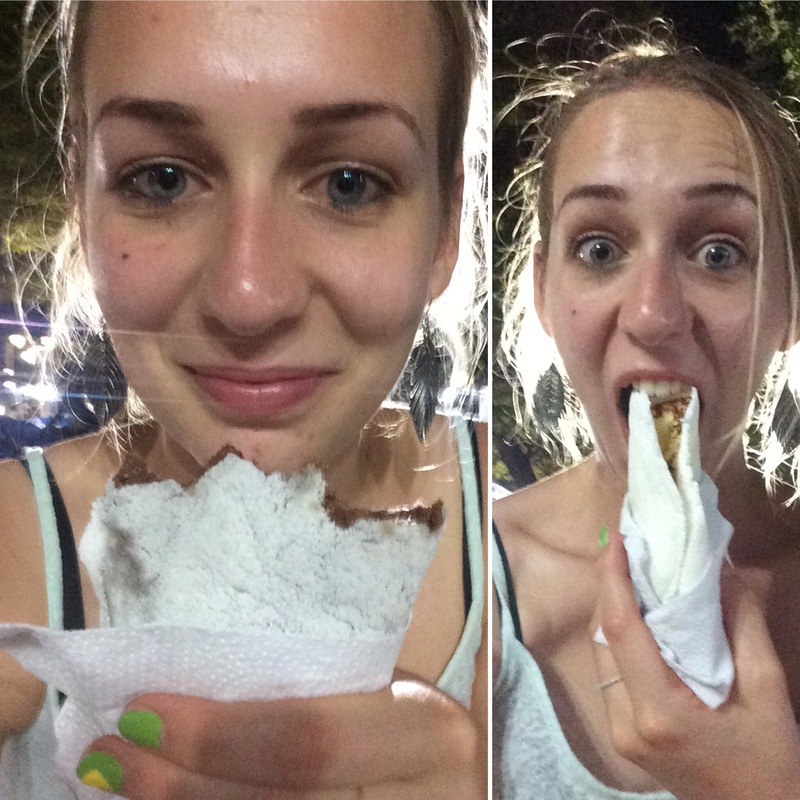 The taste is hard to describe – it looks like a prawn cracker, has the texture of Yorkshire pudding, but is also very salty! It tasted good! 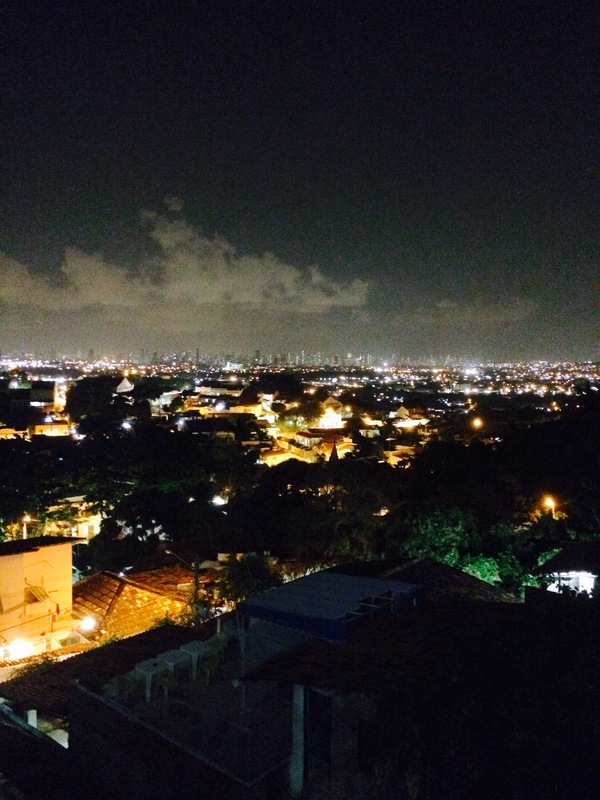 During this trip we also got to see a stunning night time view of old Olinda, the sea and over to Recife. It was a welcome trip out! This morning also saw us making smoothies with the girls. This went down a storm with the girls and the staff! Iracy (Rose and Rosely’s mum, the cook and mum for everyone else here too), was in heaven! Gordo especially enjoyed this and sat down to enjoy his in the sun! We will be doing this again this afternoon with the remaining girls in between the painting. 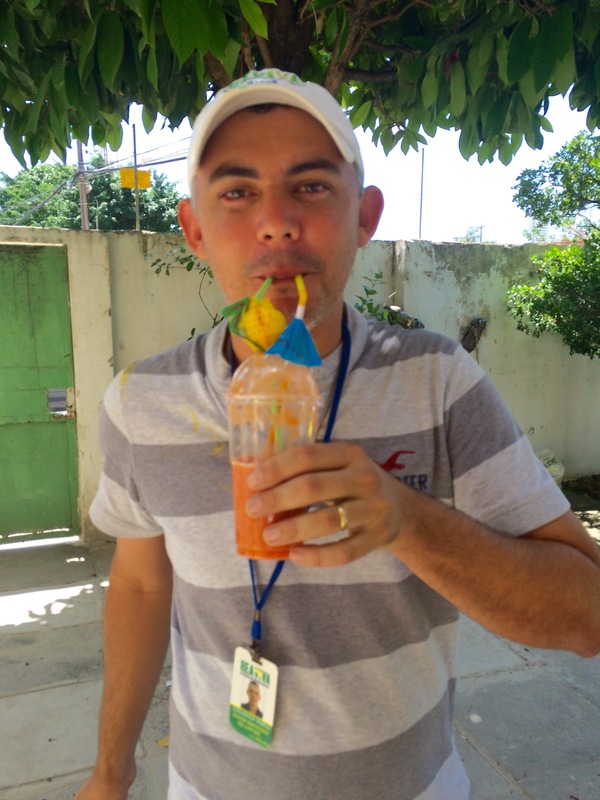 Iracy and Gordo enjoy their smoothies! Tonight will also hopefully see us hitting the streets of Olinda in the combi to help the homeless. A few of the girls have even been found and brought the the house this way. I hope that this will be a real experience for us to learn and show the people we meet a small taster of God’s love for them. Hopefully this will take place as plans often change! Anna first came to Revive over a year ago. Both her parents had died and she had technically been living with her granmother but spent her days going from one person’s house to another between going to various parties where she would take a lot of drugs. It had been a struggle for her to adapt to the change in her life when she came and unfortunately she ran away. She then became pregnant but sadly lost the baby at 5 months. After the loss of her baby she was then taken to a governmental home again where she specifically requested to be taken back to Revive as she believed that only there could she make a difference to her life. Anna is one of the eldest girls and has a funny, sensitive and bubbly personality. Anna is clearly still grieving for her baby and will be for the rest of her life, she still has some of her baby’s clothes in her room. Our prayer for her is that she can rest in God’s peace and love as he heals her from this ordeal. Thank God for having a fun time doing the various activities with the girls. Thank God for providing us with rest and time to ourselves at the weekend. Thank god for each and every one of the girls and staff here and their differing personalities. Please pray on for productivity in painting the house – that we will be able to get lots done in the next few days. Please pray for the girls and what they learn in the devotionals – that they would take it away with them and think on it further. Please pray for the staff to come to know God on a deeper level. Please pray for Anna and her situation – that God would comfort and heal her in her grief and that she would know his love further. Time for another update – I wish I could do them more often but we tend to be quite busy with little time to sit down and write! This weekend was just great – lots happened so I’m going to go day by day! 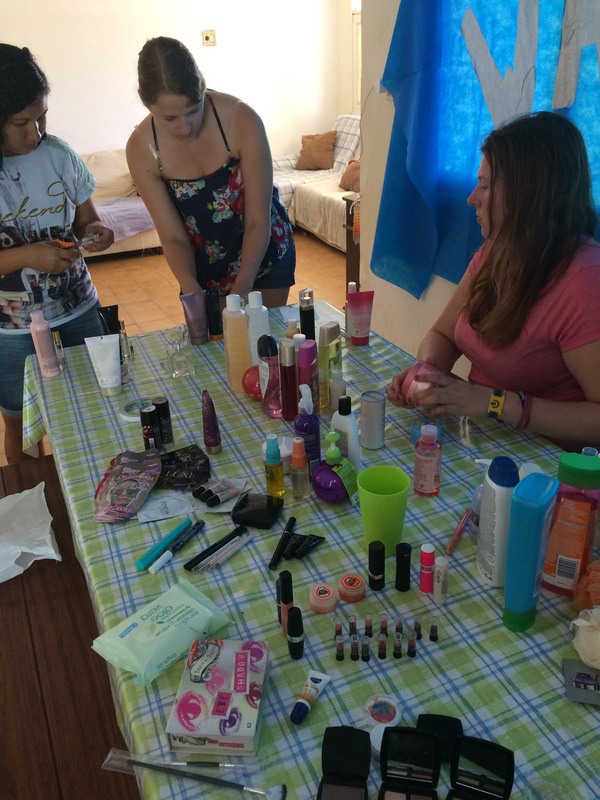 Saturday saw revive turn itself into a salon for the girls. 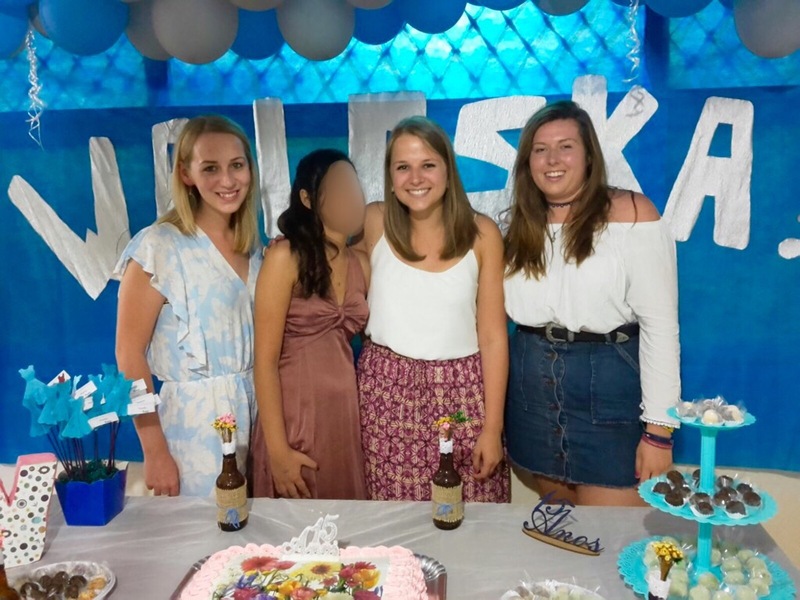 The evening was one of the girls’ 15th birthday party – which is a massive deal here, even bigger than the sweet 16 in America – so naturally all day was spent preparing for it. We all had a slightly longer lie in which was nice, and then the beauty regime started with nails from after breakfast, then turned to hair and make up, right up to when the party started! The girls all make a huge effort when it comes to leaving the house and looking their best, or even for a party at home – so we felt we needed to do the same! This also gave us the opportunity to see what the girls had and divide up all the gifts which we brought over from donations. 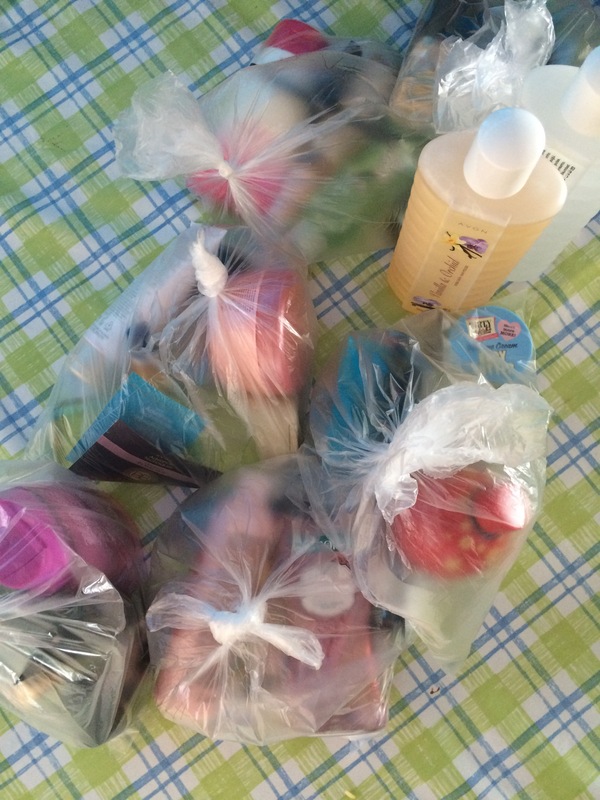 We made them each up a little bag of cosmetics, based on what they already had and what they liked. Anything left over was out somewhere where they can all share. They also absolutely loved the hair straighteners and curlers. 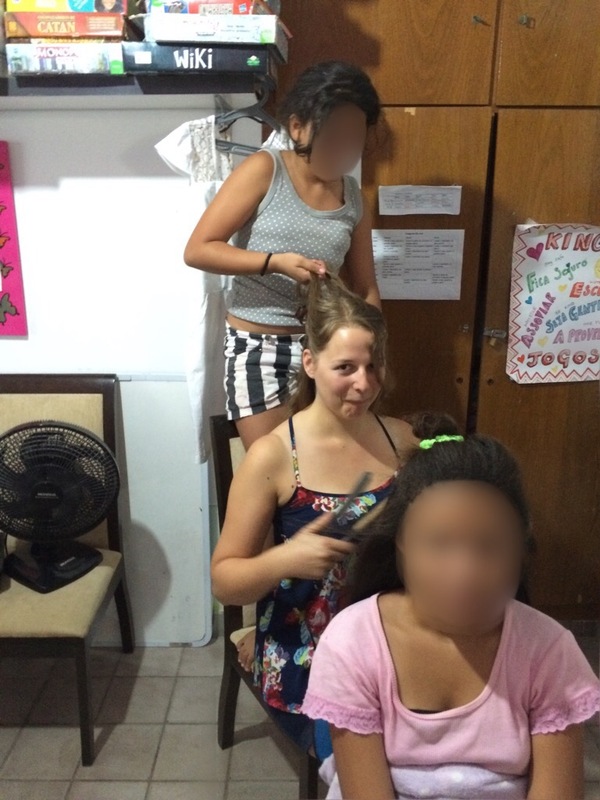 Rosy was straightening one of the girls hair for almost 2 hours it was that thick – but it looked great afterwards! 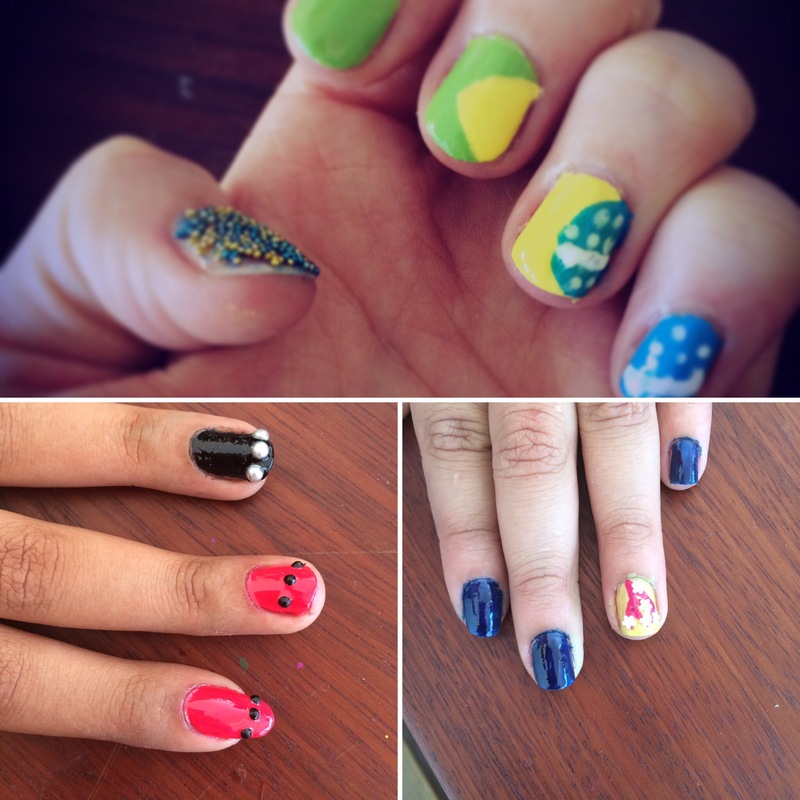 This felt like a really rewarding day – just to spend time doing the things they enjoy and making them feel special. In the evening the birthday party was great! Andy got to dance the waltz with the birthday girl (a turning 15 tradition) – no doubt just one of many times he will dance the waltz! Andy, Gordo (the handyman) and Philipe are great examples of how men should be treating their wives, sisters and daughters. It is lovely to see Andy looked up to as a father for all the girls here. Sunday in Brazil was Father’s Day. A difficult day for all of the girls in the house. It was nice that the birthday party fell the night before as a little celebration for the girls. Rosy spoke on the Good Samaritan at the morning church service – and one of the girls helped me and Sophie out in acting out a modern day version of this. Naturally we used football to demonstrate it – this will never fail to grab their attention! Andy then said a little about how God is our perfect Heavenly Father – a moving moment for lots of the girls. 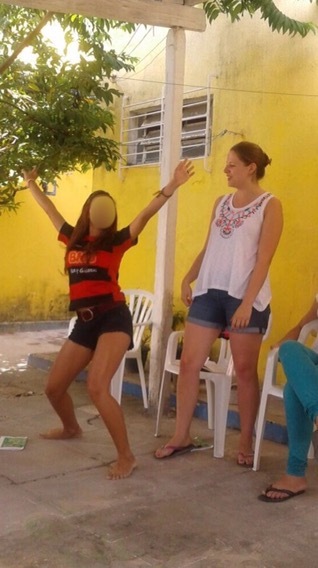 The church service itself was informal and fun – I tried to sing in Portuguese which I think provided much hilarity for the girl stood next to me. I did love the vibrancy and the dancing though! Sunday afternoon saw us have time away from the house and the girls on our own for the first time. We went to the beach and were stared at for most of our trip out – 3 white girls is a rare occurrence! 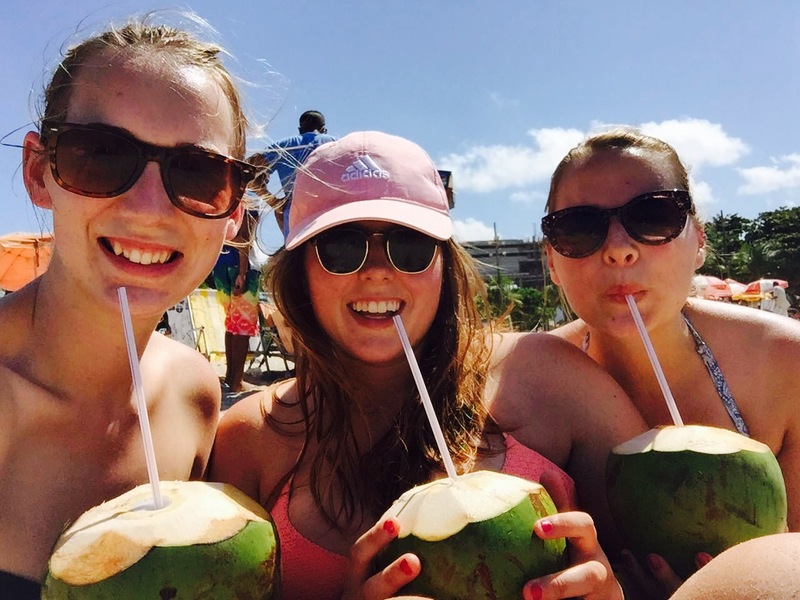 We drank out of coconuts and soaked up the sun. 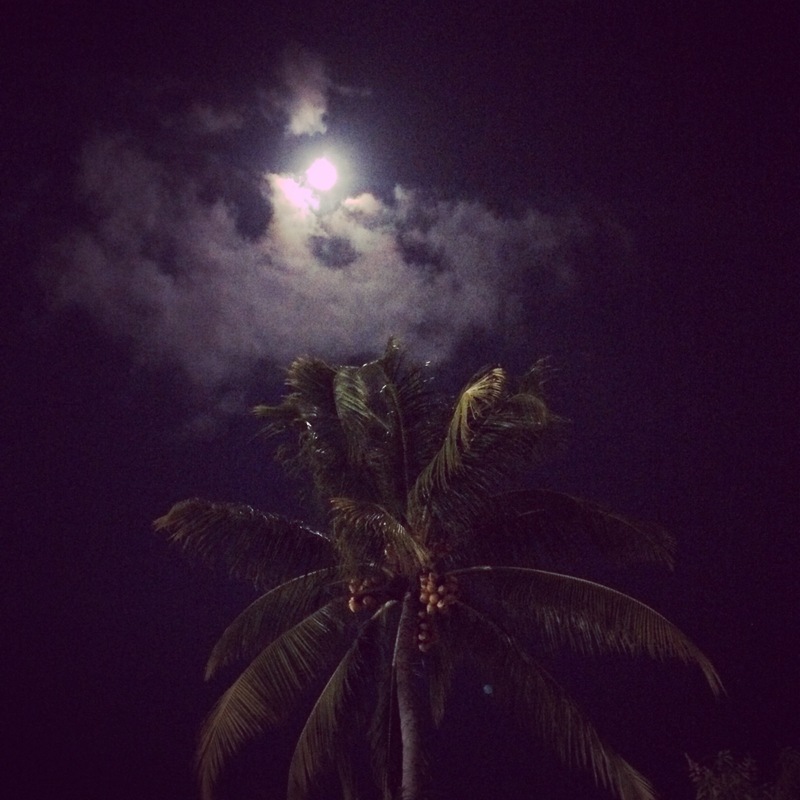 It was a lovely time to chill despite the beach being crammed full of Brazilians celebrating Father’s Day. We then tried to have some food but found most places we wanted to visit closed so went to the Brazilian version of McDonald’s called “Habib’s” and ate even more carbs. They were showing the olympics however so we managed to see some GB gold medal winning! On Sunday evening we went to the house of the ReVive England volunteer coordinator Rachel, and her father Steve who is one of the Brazilians on the ReVive board. Steve lives in the penthouse of an apartment block in Recife so we had a great journey over in the combi and a great view of the city skyline from the top. 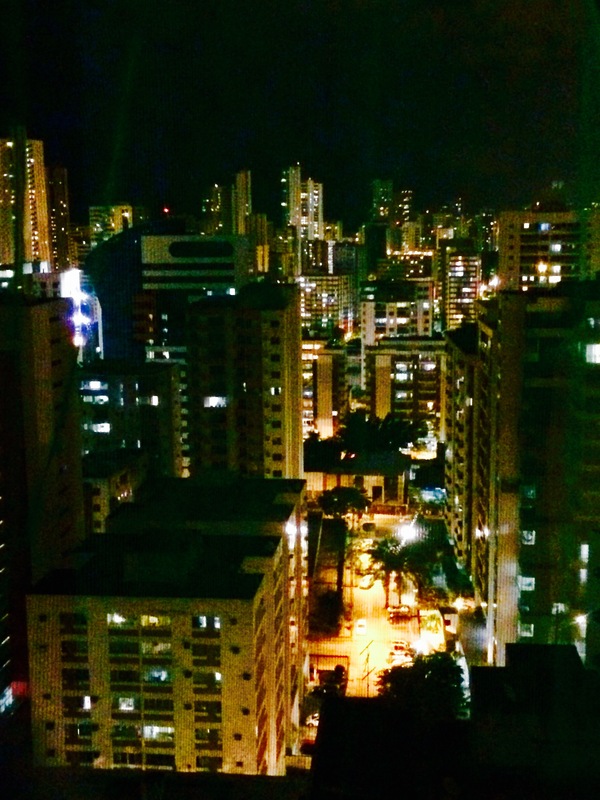 It was like being in New York – Recife is huge! It was great to meet Rachel and Steve and hear about their plans. Rachel and Sophie even had a friend in common – it’s a small world! Afterwards Andy and Rose took us to the big shopping mall in Recife for dinner and for their little girls, Sophia and Julia to play in the games station. It was lovely to spend more time with them, and the mall was quite something! However, Andy told me that they had to move the shanty town to build the mall as the land was cheaper – we drove past the shanty town and saw that it was by the edge of the river and some of the houses were on stilts. Sadly this is typical of Brazil with the divide of wealth. Jane came to the ReVive house 2 years ago, just in Rosy’s last week. 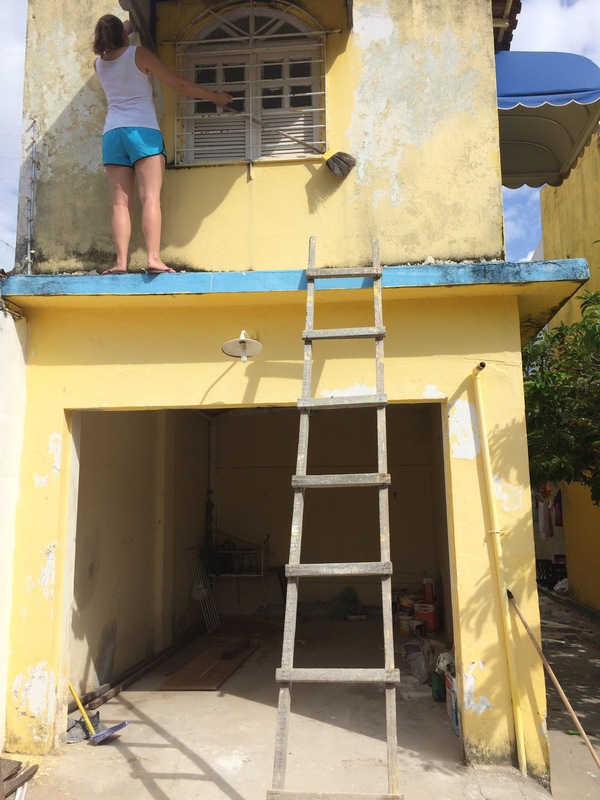 Rosy told us that when she arrived she was physically a mess, with matted hair and scraggly clothes. They quickly discovered that she couldn’t read, write or count to 10 as she had never been to school before. Emotionally, she was really difficult and refused to do anything she was asked to do. Sadly Jane had come from a heartbreaking situation where her mother would take her every weekend to her grandmother’s house where her grandmother’s partner would sexually abuse both Jane and her mother and then receive payments for his friends to do the same. Coming back here now and seeing a confident and chirpy girl with long sleeky hair who always wants to help out and is favoured by her teachers, is just an example of the work here at Revive. We are just coming to the end of day 5 here – it feels like we have been here months! We have all settled in well, and been made to feel so welcome by the staff and the girls. The last few days have been very fun and filled with laughter. Yesterday morning (Thursday) we walked to the ‘Hiper’ supermarket to buy some snacks and chocolate for our room and some supplies for activities with the girls. The supermarket was massive – it was a Homebase, Range, B&Q, Boots and an ASDA all rolled into one. 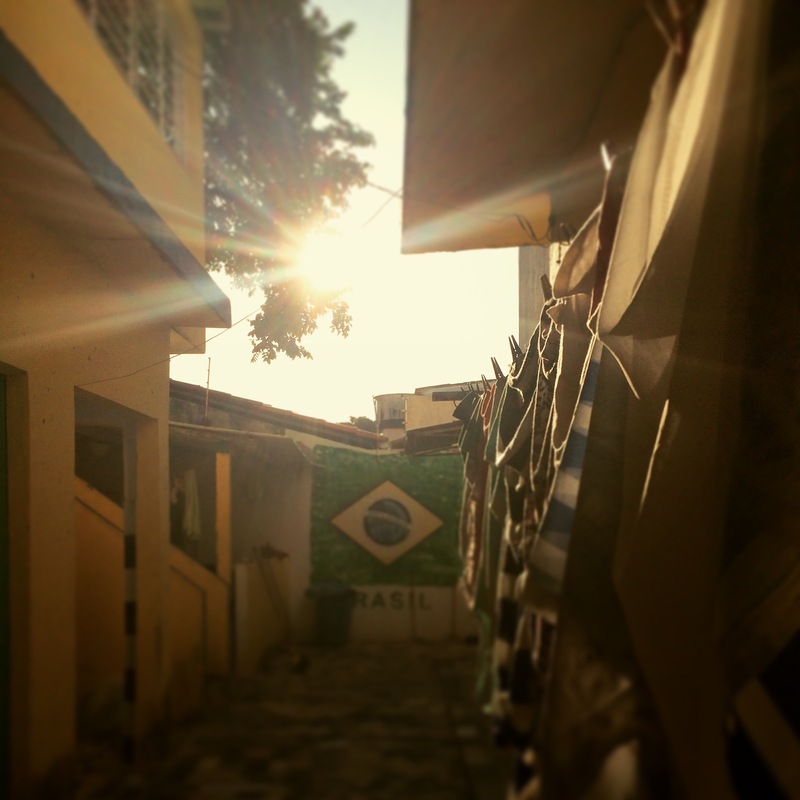 The walk to the market was lovely in the sunshine (most of the house is in shade to protect the girls from the summer sun, but we do try and catch the rays when we can), and we also survived the crazy Brazilian roads! The cars don’t tend to stop at zebra crossings… On the way back we walked along the beach front – this was beautiful and despite the water not actually being too clean at this part, it was the bluest water I have ever seen. I am really looking forward to going to Muro Alto at the end of our trip where we are told that the water is beautiful. 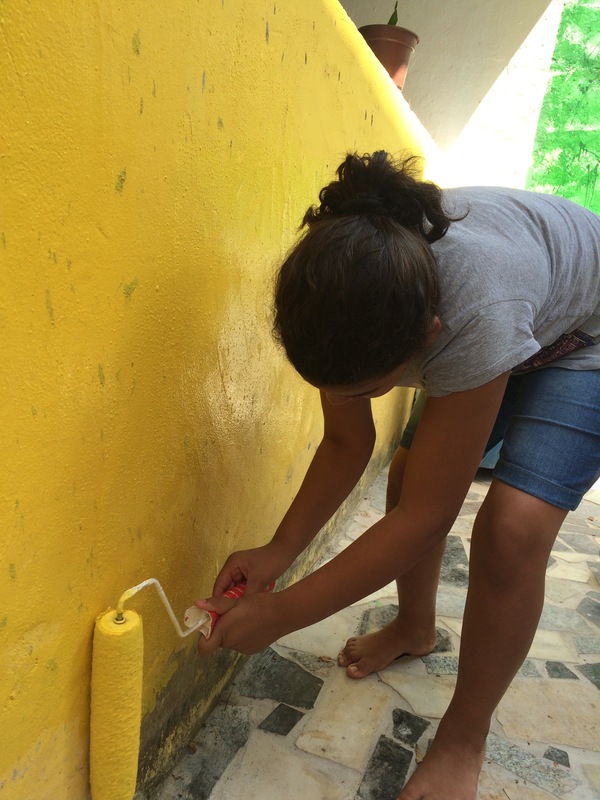 Yesterday we also began the work of painting the whole house. 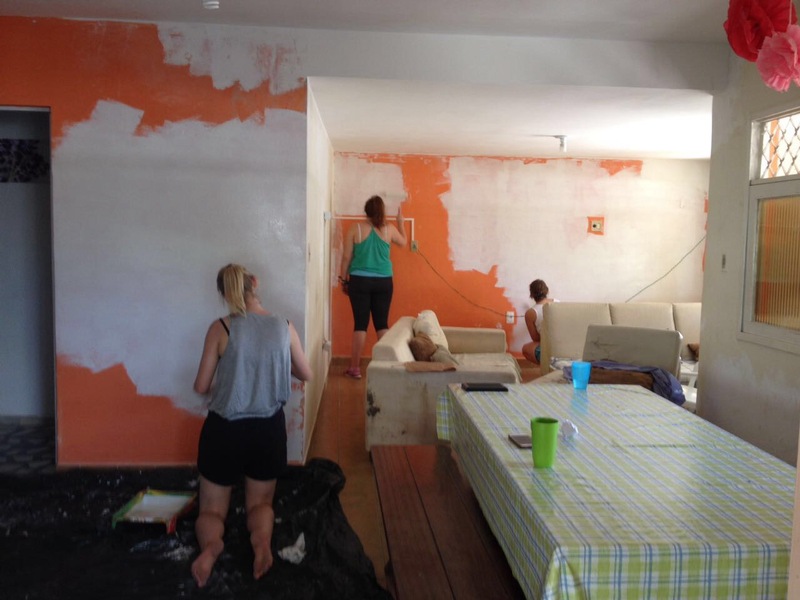 We have started with the lounge and dining area for the girls. Due to all the building work the rooms are all in need of a good re-paint and a scrub. 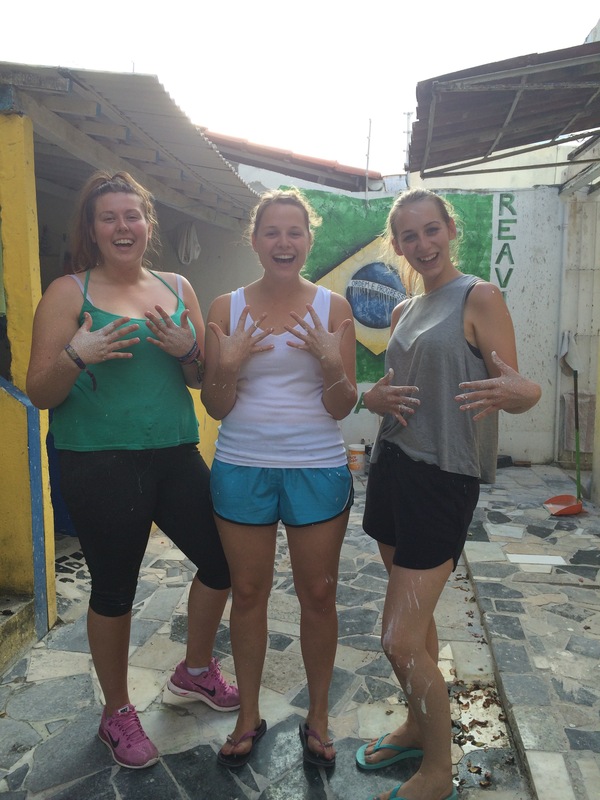 Brazilians are extremely clean – we have been told that they shower at least 3 times a day and they think we smell if we don’t, so I’m sure they will be happy when the building work finally stops and everything is looking clean again. 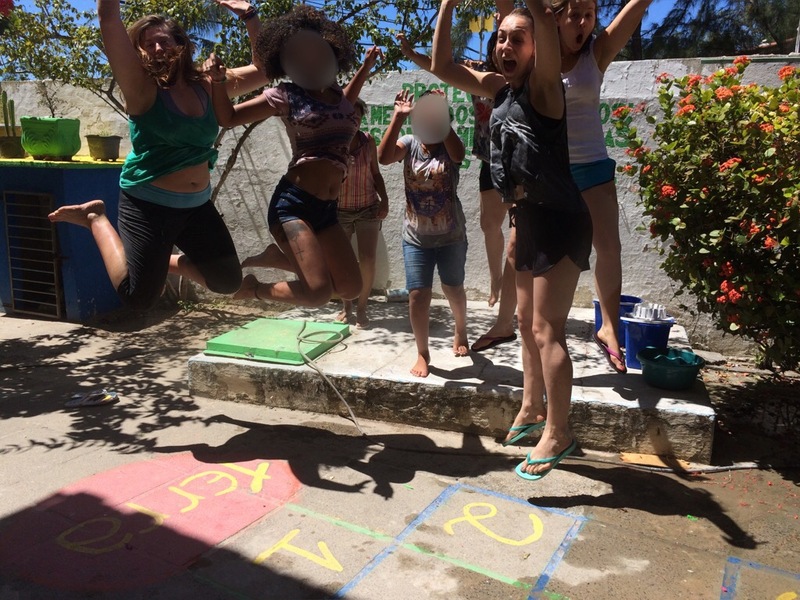 We are nearly hitting the Brazilian level of 3 showers a day – all the paint mingled with sweat means that a nice cool shower at the end of it all is welcomed. I ended up looking like I’d had a shower in the paint and it was a long shower to get it all off! Today we finished some of the cream walls and now we are ready to start adding a splash of colour to some feature walls and the outside of the house. I will hopefully post a before and after picture in a couple of days’ time! Papped hard at work painting the walls, and after when we were covered in it! We have started to play some of the Olympic Games too! 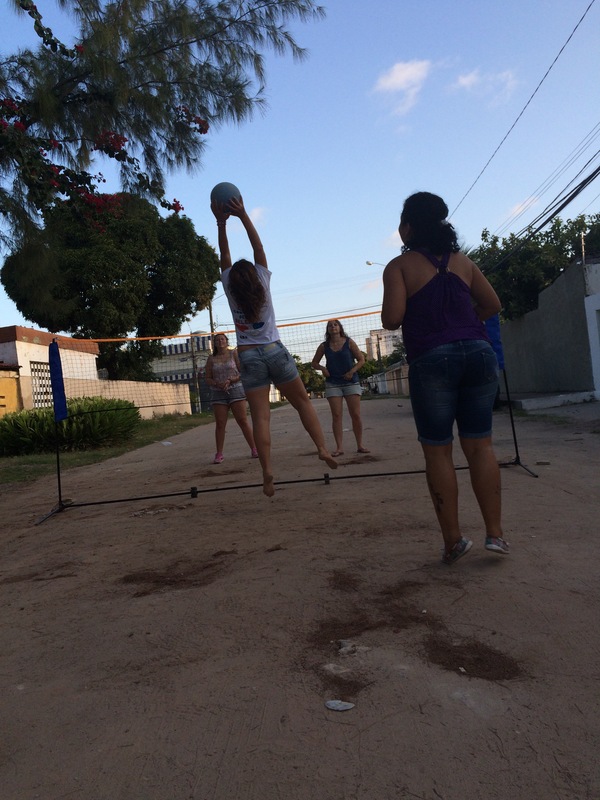 Yesterday we set up the volleyball net in the street outside the ReaViva house. We also played some silly games in the house too. The girls all loved them! 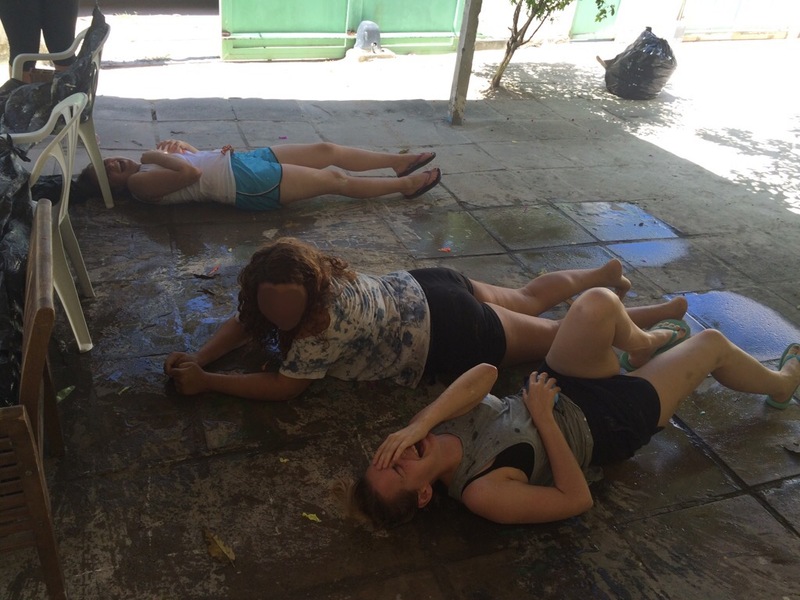 Today we have had two water fights and played blind battleships (3 showers will be had today) with water balloons. This was extremely fun and the house was filled with squeals and laughter of us all getting drenched! At the end it descended into a big free for all with the balloons. Some of the staff were clearing the area quickly and even a builder had to cower behind his box! The top photo is when I accidentally burst my own water balloon over my head during battleships! I feel we have also began to build great relationships with everyone around us. 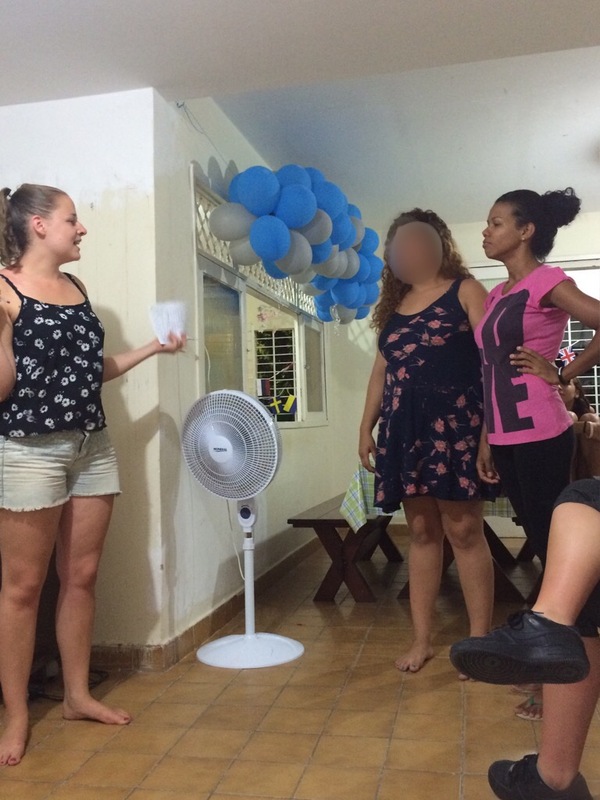 The girls are starting to open up to us more, and are coming to speak with me and start conversations even though my Portuguese isn’t as strong. I am getting there, and I am loving learning new words that come in handy to use again and again. 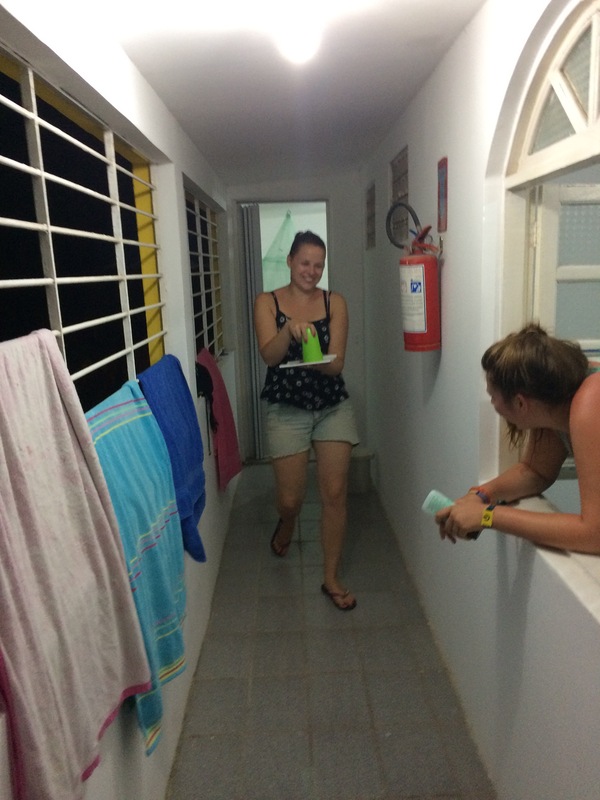 Laura – I have used the phrase ‘pineapple’ many times so it came in useful after all! When I return I will definitely keep up learning the Portuguese. I hope over all my posts to say a little about each of the girls in the house, although I will not post specific pictures and names will be changed to help protect them. Sophie is a very caring and sweet girl. 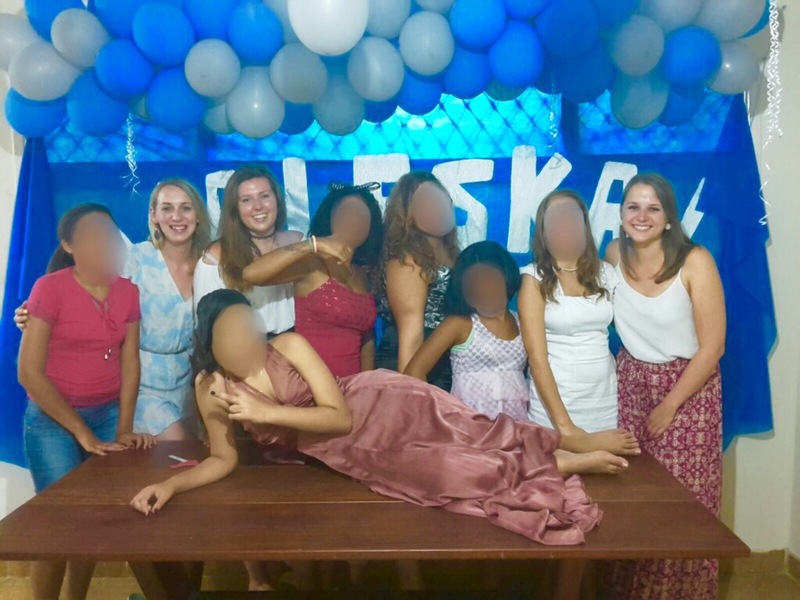 We have found out that she actually comes from a more privileged background, unlike most of the girls and staff who come from the favela or the shanty town. She has told us that this some times makes her feel bad around the other girls. Her father pays for her to attend private school when the other girls cannot go – meaning she has more opportunity ahead of her. Sadly though, her father stated that he did not want to look after her anymore, so took her to the judge and abandoned her. As far as we gather, her other family has also rejected her. 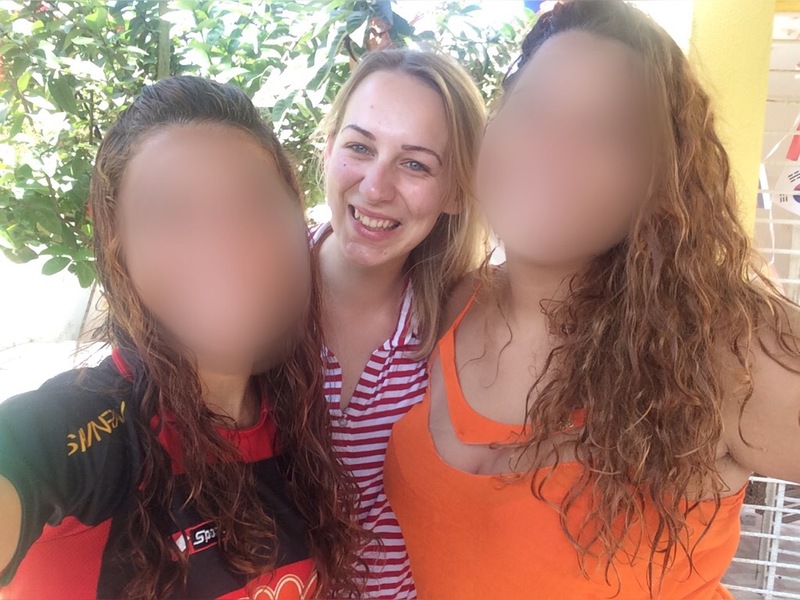 Sophie has pictures and connections with them on Facebook, but other than this they have no contact with her. This baffles us as she isn’t any trouble and is one of the quieter, more mature girls in the house – however even if she was trouble, this would be no excuse either. 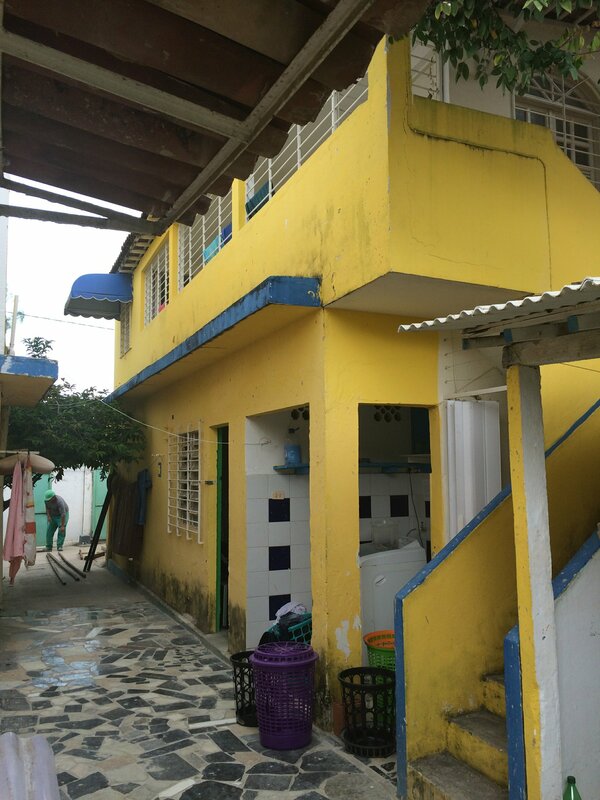 The house at ReaViva is however providing her with stability and family. We hope that this will help her to gather the confidence to achieve her aspirations and make the most of her education. She told us she would like to visit Budapest, and I hope that she can one day! 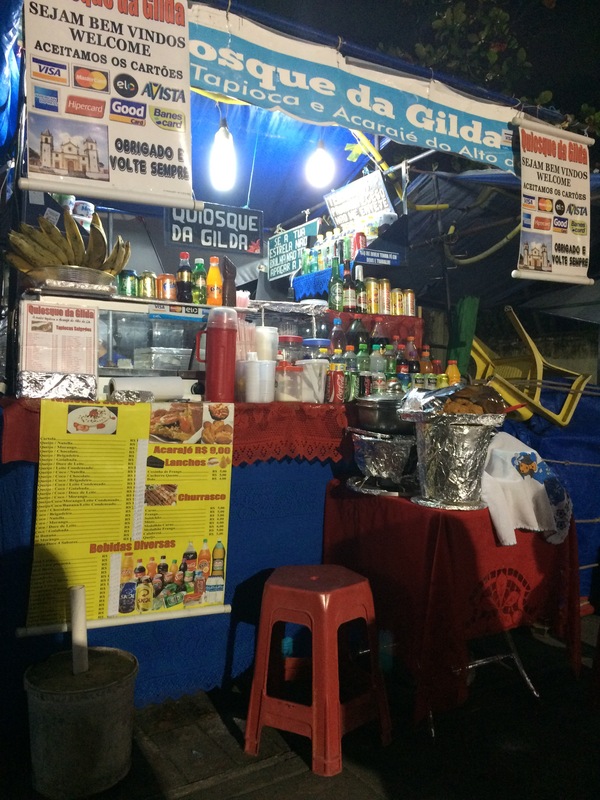 Last night we also drove up to the favela, to Gordo’s house (the ReaViva handyman) for a prayer and pizza night. We spent time singing and praying in Portuguese for ReaViva and had some amazing Brazilian pizza. 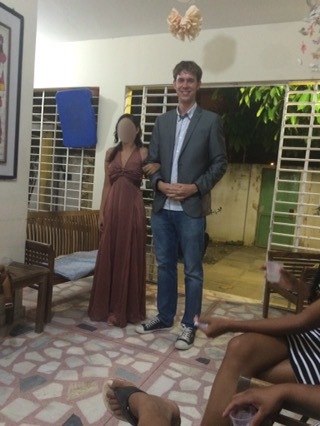 It was a really humbling night and we felt very grateful to be welcomed into Gordo and his family’s home. 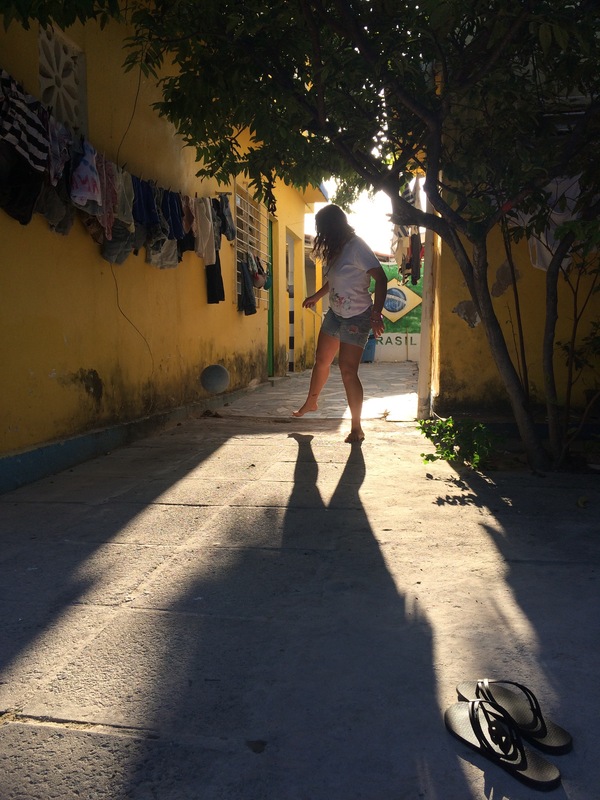 I loved the drive over past the shanty towns and through the favela. It was eye opening – and a little hairy at times! 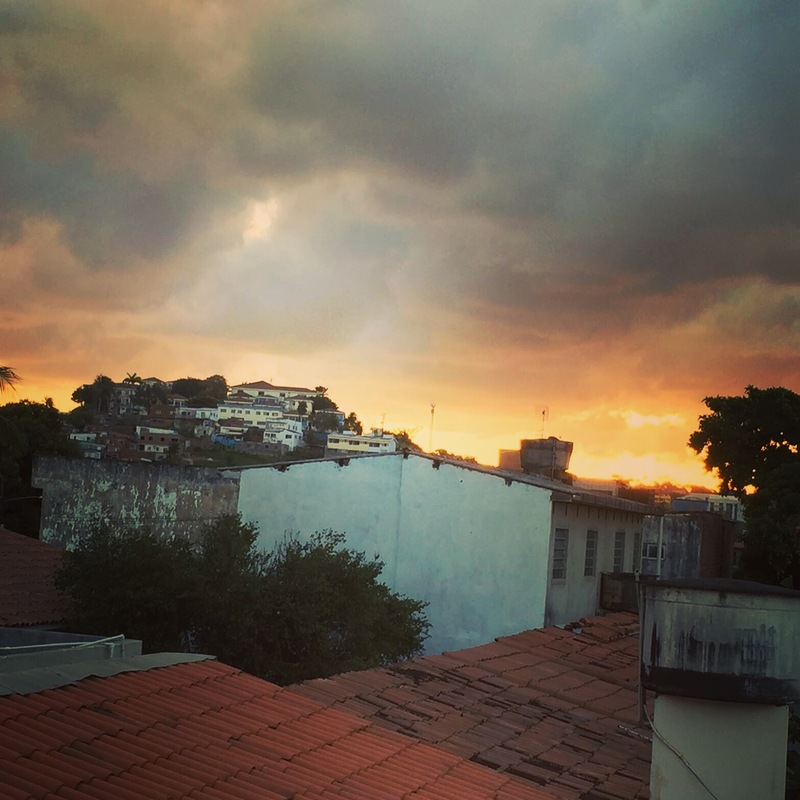 A view of the favela from the ReaViva house. 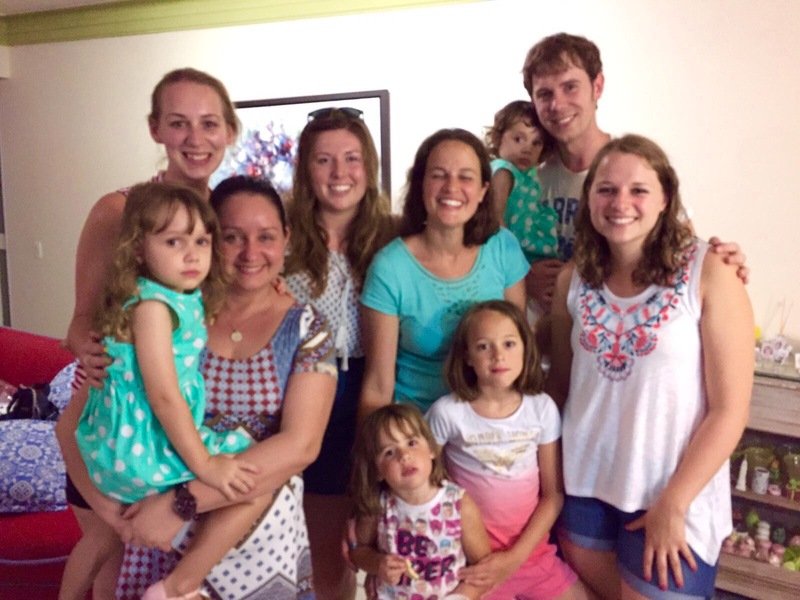 Please pray for Sophie, that she would feel loved and accepted at ReaViva and ultimately find the love and acceptance she desires in God. Please pray for continued safety and productivity in painting the house. 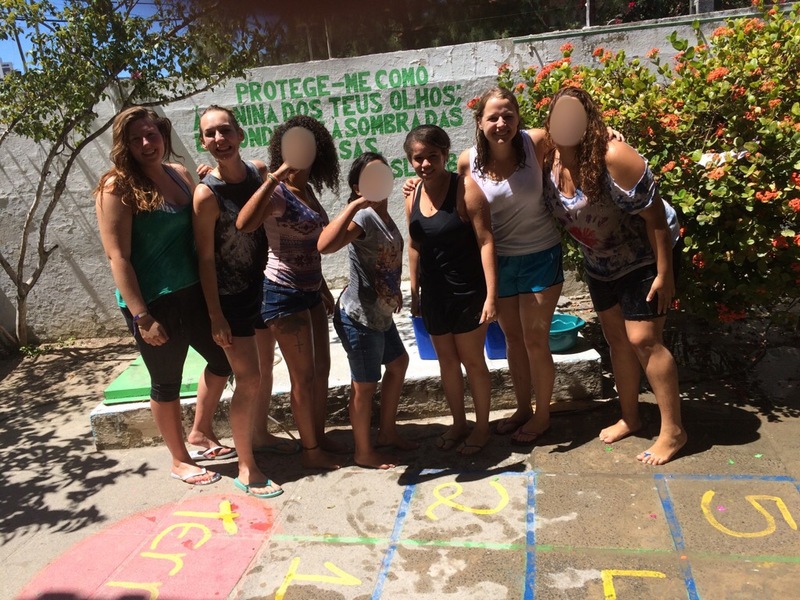 Continue to pray on for each of the girls to grow and develop in knowing God, and for us as we try to help them. Thank God for all the staff at ReaViva who work so hard to make this a place of happiness. Please pray on for safety and fun as we lead activities with the girls, and as we start to take the girls out of the house to do some of these. I’m new to blogging but have always wanted to give it a try, so bear with me and here goes..! 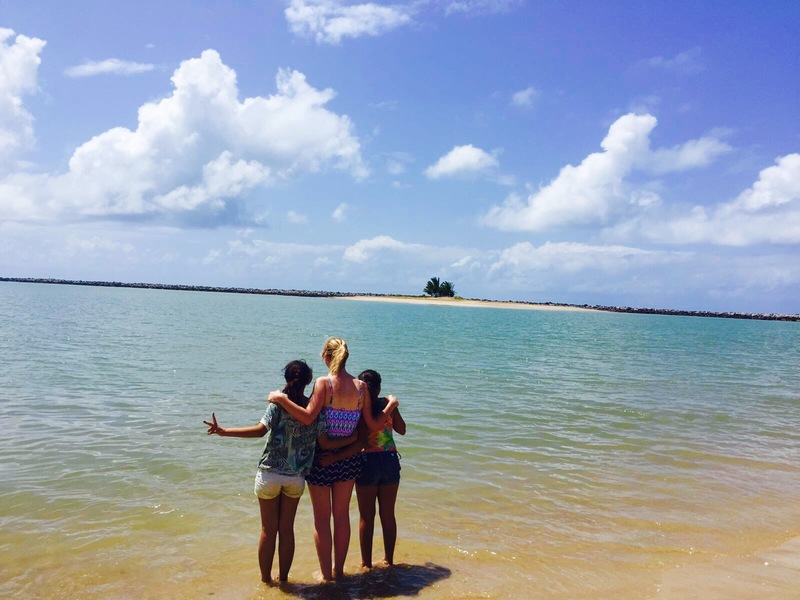 Rosy, Sophie and I have safely landed and are beginning to settle in here in Olinda, Brazil. Thanks to all who have prayed for our journey out here, it went very quickly with next to no hiccups – our delayed flight from Gatwick made up an hour’s worth of time! Andy picked us up in the really cool ReVive VW camper, which I loved! The ReVive yard and VW camper! My first impression of the house is that it is a place of peace for girls that have come from less than peaceful circumstances. Not only that but it is providing a place of fun, laughter, safety and education. Most importantly, the girls have a loving family here that most of them do not have outside of the house, and we feel very privileged to be invited to be part of it. We are still learning about each of the girls’ stories but I hope to write more about each of them in following posts. Their individual personalities are all shining through even after two days: they are all funny, caring and energetic girls! Most days start at 7am – the girls must be ready and eat breakfast by 8am. Then they head off to school at different times and for varying lengths. This means we have time throughout the day to build relationships with each of them in smaller groups. 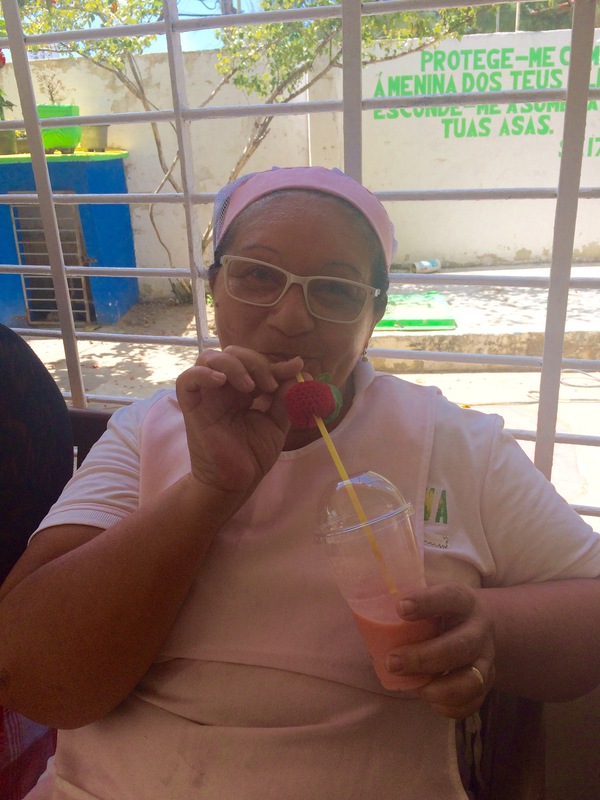 I hope to learn more about the girls as time goes on; at present they are involved with social workers, psychologists and nutritionists as well as all the staff at ReVive so some of their time is spent with each worker. Over the past few days we have just been getting used to the routines and timings – although these are loose terms here in Brazil! I am learning to go with the flow and embrace the relaxed attitude. We have been able to run a few activities and games this morning, and have spent some time painting flags and t shirts ready for the the ReaViva Olympic games which we will run next week, complete with closing ceremony! 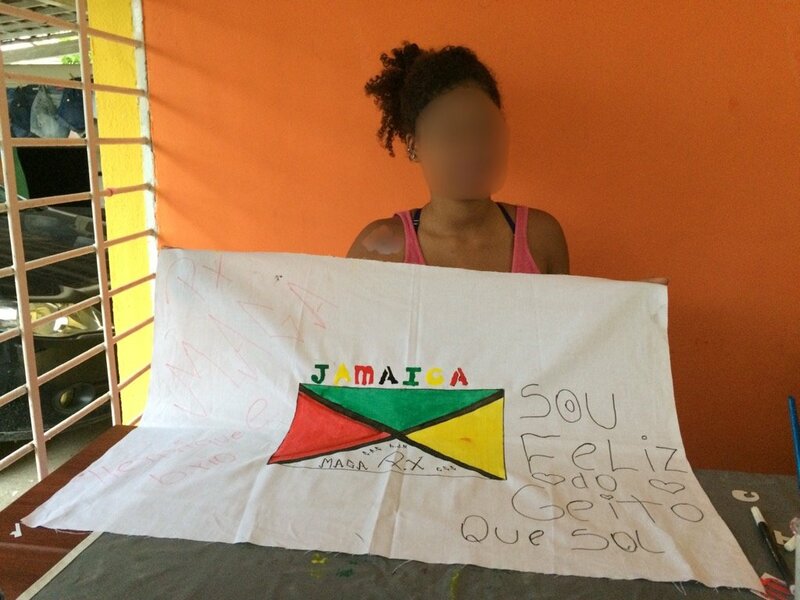 One of the girls holding her Olympic flag. Faces are blurred to protect their safety. Andy has also suggested that a lot of painting can be completed whilst we are here! The builders are just finishing up in the new extension, which gives us brand new walls to paint along with repainting the ones that have been messed up in the process. No doubt we will be kept busy with this along with running activities for the girls! Meals are simple but so far have tasted good. Unusually Brazilians eat their main meal at lunch which is followed by a nap, and it usually consists of rice, beans and an unnamed meat. Carbs to the max, but lots of fruit has been offered to balance it out! Our annex block is doing the job nicely, we each have a little bed and a mosquito net. The bathroom is separated by a plastic corrugated door so privacy is out the window but we are embracing it! 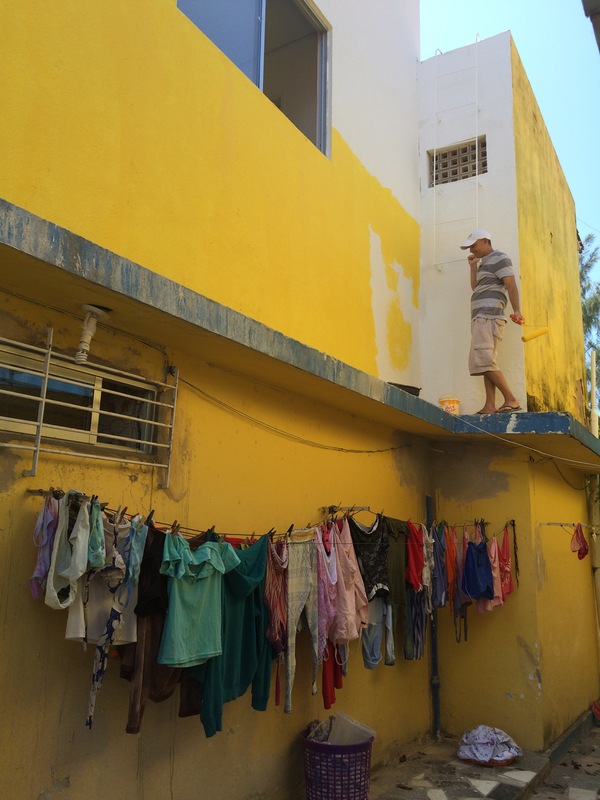 There is an electric fence on top of the wall of the property and 2 lovely guys called Leto and Salamão take turns to sleep in a room below us every night as security for us and the girls, so we feel very safe. Andy informed us that sadly the crime rate in the area has risen so security is becoming increasingly important. On an evening the girls either attend a devotional or ‘thought for the day’ or have time to rest. Last night we ran this time and it evoked lots of conversation. Our annex block and wash area! Weather wise it has been lovely and hot with only one rainy night- the nights aren’t so hot that we can’t sleep but there isn’t any need for a blanket and we have a fan blowing all night. Mosquitos have so far mostly stayed away too. I love the temperature and the way of life here but this is only winter! The girls learn about types of violence from the ReVive psychologist. I am slowly but surely learning to speak the Portuguese language! Watch this space… I aim to be fluent before I leave! Lots more updates to come – hopefully they will be slightly more planned and slightly shorter, now that we have settled in and have a vague timetable. Please give thanks for our journey over going smoothly and for being made to feel so welcome by everyone here. Give thanks for the extension which looks fantastic and is coming along nicely. Give thanks and continue to pray for rest and no illness as we adjust to the new time difference and food. Give thanks for opportunities to lead devotionals with the girls and pray for this time to be fruitful and for us as we lead it and the Sunday service, looking at Ruth and James. Pray for us to build good relationships with the girls and with staff. Pray for the girls to have fun in the time we spend with them! Give thanks and continue to pray for our safety in the project and when we head out. Please pray for God to provide financially as ReVive has suffered due to the post-Brexit pound drop. We’ve just launched a fundraising campaign to try and raise £30,000 to build an extension to the first floor of the ReVive house. There’s loads more information about it plus a video and info about how you can get involved over on the ReVive Extension’s webpage – just look for the link in the menu! Daily life at ReVive has been extremely busy over the past couple of months, one of the highlights of course being the British Ambassador’s visit to the ReVive house at the end of February. It was a privilege to receive him along with the British Consul and other representatives from the Consulate and Embassy. Preparations started a few days in advance, when we were very pleased to receive word that the Ambassador had personally requested that he visit ReVive on his next trip to Recife. The girls spent a lot of time preparing the house and even made some bunting with Naomi, one of our most recent volunteers! The Ambassador, Alex Ellis, arrived with British Consul Graham Tidey and immediately sat down to introduce themselves and get to know all the girls and staff. The ReVive girls were very keen to show the Ambassador around the house and had a great time playing a few rounds of French Cricket and some parachute games in the sunshine. Afterwards it was time to settle down with some afternoon tea and cake, whilst the Ambassador spent more time talking with the girls and answering questions about life in the UK. We even convinced some of the girls to try some Yorkshire tea but even with milk, the girls weren’t very impressed! Overall it was a lovely afternoon, the British Ambassador said that he absolutely loved visiting ReVive and it was something from different from what he is used to doing. 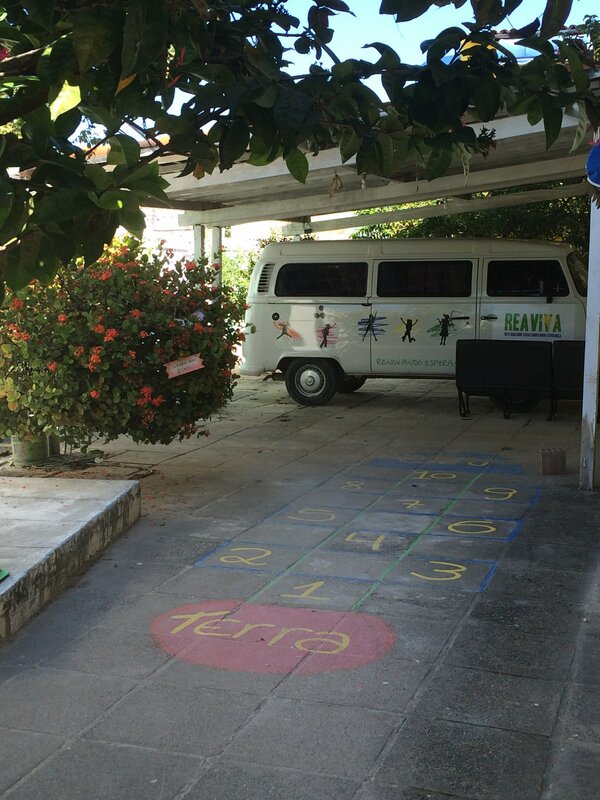 It was a great chance to spread awareness of the work of ReVive in Olinda , and hopefully this will spark more of a relationship between ReVive and the British government in Brazil. We are already looking forward to taking part in commemorating 90 years of Queen Elizabeth’s reign with the British Consulate in June so stay tuned! Yesterday, Andy was interviewed on BBC Radio about ReVive’s work in Brazil. Andy, Rose and the family are currently back in the UK for a few weeks. If you’d like to hear the interview then you can do via this link http://bbc.in/25tPoLC Just start listening from 2 hours, 12 minutes and 12 seconds into the show! We’d like to share with you all some of the difficulties/challenges/interesting things which happen in the day to day life at ReVive. This post is on Schools. Once you have the papers the bureaucracy doesn’t stop there! You then need to have the child’s birth certificate and other personal papers in order to enrol them… but most girls coming from abusive and exploitation situations don’t have these documents with them. This then means having to track down these documents – sometimes needing to go to the aggressors house to get them! School Spaces – Just having the right documentation doesn’t mean a space at school is guaranteed! We try to put the girls in the school’s closest to ReVive – imagine if 10 girls studied at 10 different schools!? The school run would be a marathon! Unfortunately, the local schools are usually over subscribed… Plus, the girls arriving at ReVive tend to do so in the middle of the school year – another complicating factor for putting her back into education. We do have a few aces up our sleeves – we can request a judicial order that the school accepts the girl regardless of having space or not! The Girl is way behind – One of the most recent arrivals at ReVive is a 13 year old girl … she would be in the equivalent of year 8/9 in the UK… but due to circumstances she’s still in year 5! So, she’s in a class with 6-7 year olds. A 14 year old arrived last year who couldn’t even read or write. Obviously, one of the most important things ReVive can offer these girls is help with their education. This is why we built a little classroom at the house and the girls have daily reinforcement classes. We’re also looking at trying to employ a part-time special needs teacher to help those far behind.